Image courtesy of Mrs Smith. 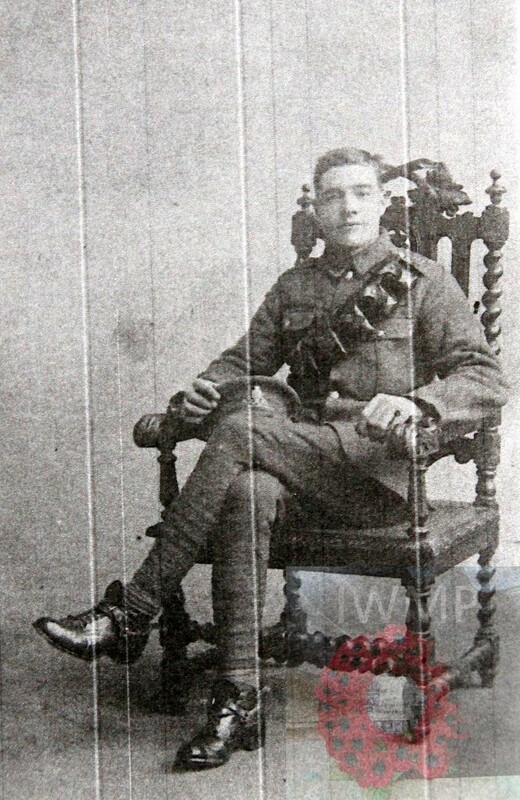 Died: 29th April 1917; age: 22; KiA. Regiment: Royal Field Artillery, 168th Brigade, Ammunition Column. Pier & Face 1A & 8A. Brother to JOHN ASHBY BARKER. 1901 6, Myrtle Terrace, Freehold Road, Ipswich. Walter was 6 years old and living with his parents & siblings. James Barker, 47, an Engineer Attendant, born Creeting All Saints, Suffolk. Lydia Barker (nee Ashby), 43, born Wick, Glamorganshire, Wales. Mary Ann Barker, 16, a Laundress, born Ledbury, Herefordshire. James William Barker, 14, a Wood Chopping Machine Hand, born Ledbury. Minnie Francis Gwenoline Barker, 13, born St. James, Herefordshire. George Edward Barker, 12, born St. James. Robert Thomas Barker, 9, born Creetingham St. Peter, Suffolk. John Ashby Barker, 8, born Ipswich. Albert Victor Barker, 3, born Ipswich. Edith May Barker, 2, born Ipswich. 1911 538 – 540, Woodbridge Road, Ipswich. Walter was 16 years old, a Van Boy – Bread – Co-operative Stores. He was living with his parents & siblings. James, 57, a General Engineer Attendant – Board of Ipswich Guardians. Mary Ann, 25, Greengrocer – Hawker – own accountant. George, 22, a Milk Carrier – Dairyman & Farmer. Robert, 19, a Milk Carrier – Dairyman & Farmer. John, 18, a Milk Carrier – Dairyman & Farmer. 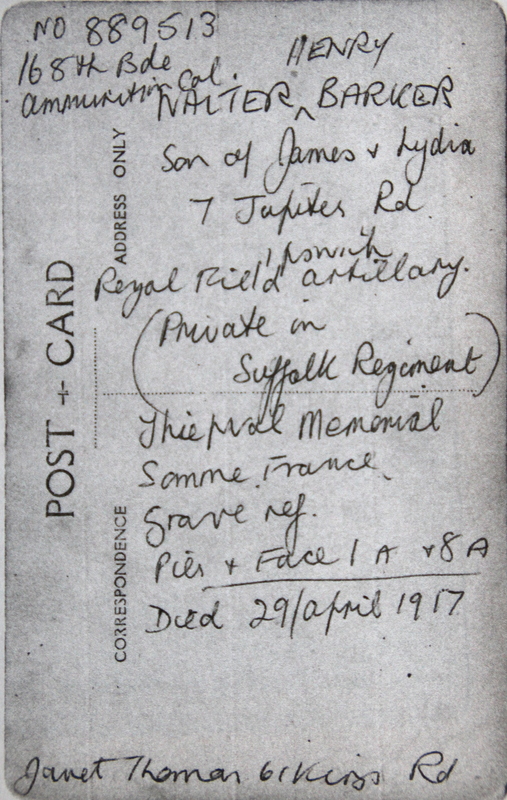 Francis Arthur L. Barker, 9, born Ipswich. 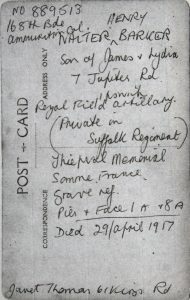 Soldiers’ Effects to James Barker – father.